A ruling from the state of Texas' Department of Motor Vehicles will likely hurt the parent company of both Indian and Victory motorcycles, while going some way to solving an age-old argument about what defines a motorcycle. Minnesota-based Polaris received the bad news recently that its forthcoming three-wheeled Slingshot vehicle will not be given approval for sale or use in the state of Texas. This is because officials in the Lone Star State disagree with Polaris on the issue of what the Slingshot is. Polaris insists the 173-horsepower machine is a motorcycle -- that reasoning being based in part on the Slingshot's chain-driven single rear wheel. It would seem that most U.S. states agree with Polaris' description, and the manufacturer has already begun shipping out models to dealers across the country. The state of Texas, however, argues that the Slingshot is far more a car, with its two front wheels, steering wheel and car-like seating. As such, the state argues, it is subject to the safety standards of a car. Section 541.201(9) allows for three-wheel vehicles with saddle-style seating, other than tractors, to be titled as motorcycles. Section 521.001(6-a) requires that cars have an enclosed compartment and feature a steering wheel, seats, seat belts, a windshield and windshield wipers that are in compliance with federal motor vehicle safety standards, plus a structure that passes a roof-crush test. It is likely that Polaris and the state of Texas will manage to smooth things over before long. 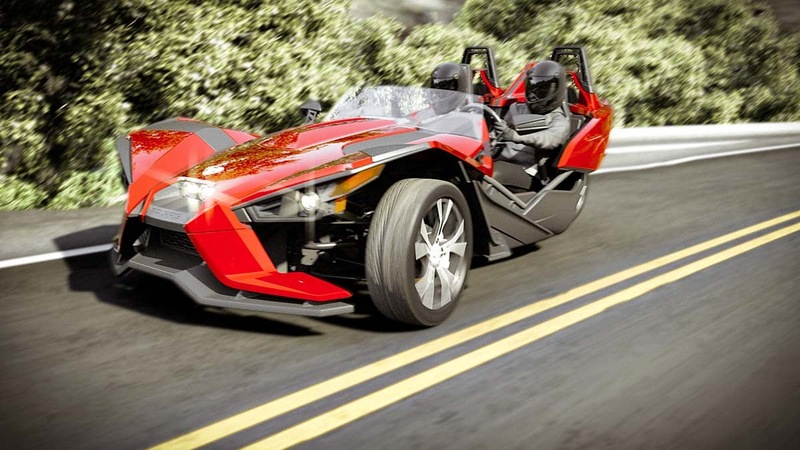 In the interim, Polaris has stopped shipment of Slingshot models to the state. Meanwhile, for the rest of us, the disagreement certainly gives fodder to those who have always argued about the definition of a motorcycle. Vehicles like the Harley-Davidson Freewheeler and Can-Am Spyder are often derided as not being "true" motorcycles because they have more than two wheels. Those vehicles have saddle-like seating, however, so their riders can rest assured that the state of Texas would classify them as motorcyclists.